This apartment is only bookable for couples or families up to 4 members. It is mandatory to respect the coexistence with the building residents. Parties and strong noises are forbiden in this apartment. 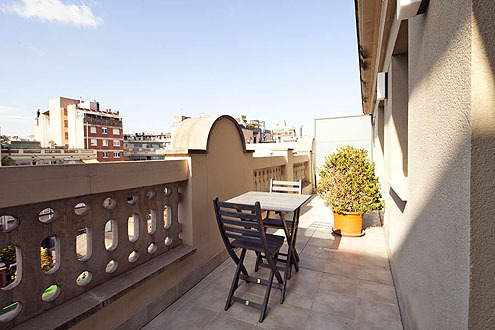 The Gran Via Luxury apartment in Barcelona is located on the fifth floor of an impressive building on the Gran Via de les Corts Catalanes, one of Barcelona’s main thoroughfares in the heart of the city. 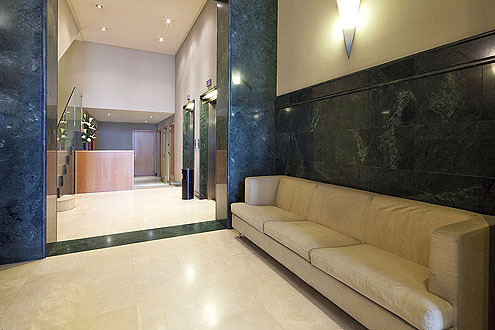 The building has a doorman, and a large entrance lobby with two spacious lifts. 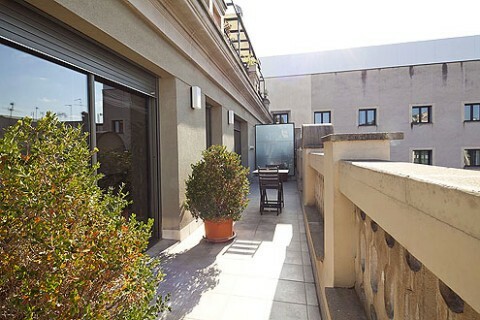 This apartment is in an amazing central location - in 5 minutes you can walk to Passeig de Gràcia (and see Gaudí’s famous buildings the Casa Milà and Casa Batlló), Plaça Catalunya, the Old Town and Las Ramblas. 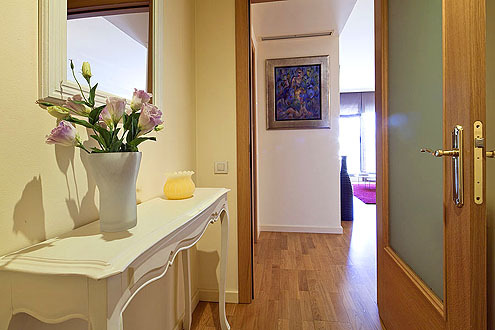 The interior of the apartment is decorated in a very clean, light, modern and stylish fashion, with attractive wooden parquet throughout. The main living space consists of an attractive living room that leads onto the terrace through double sliding doors, assuring abundant light. 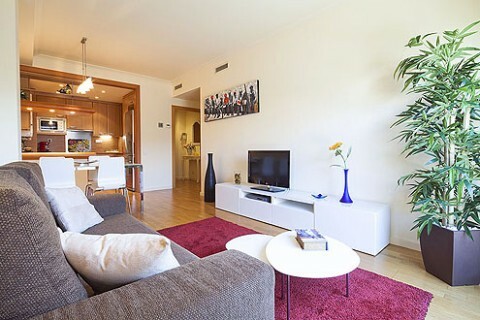 The living room features a large comfy sofa, a coffee table, a wide screen TV and DVD player, and a free Wi-Fi connection. 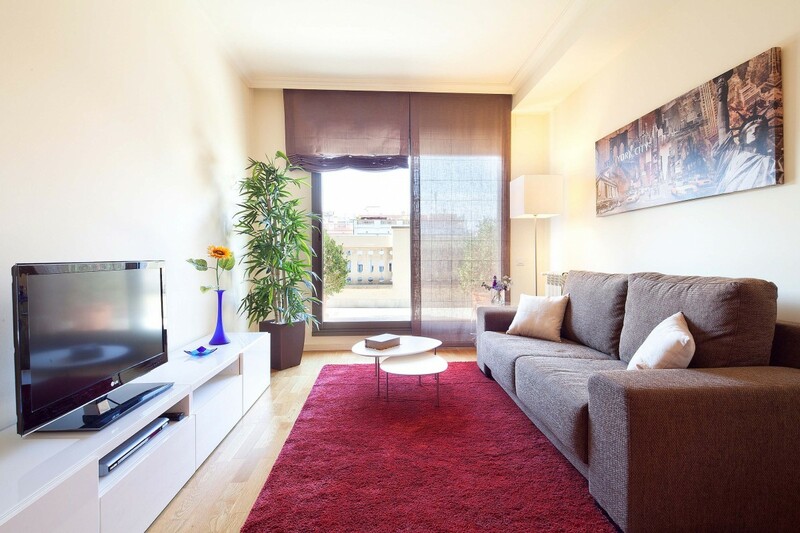 The living room and the main bedroom both lead onto a terrace via double doors, perfect during the summer heat. 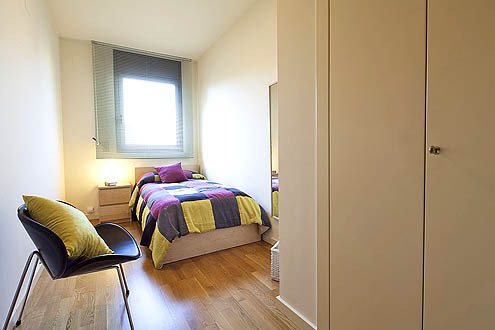 You will find both air conditioning and radiators both in the bedrooms and living-area. 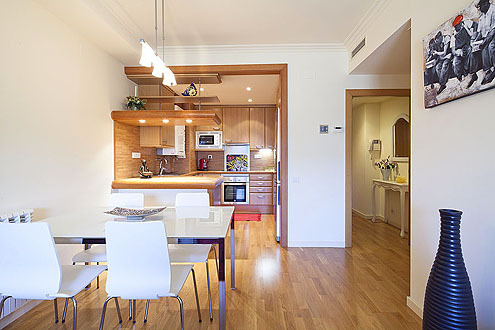 Between the living area and the kitchen is a conveniently placed dining area with a table and chairs for 4 people. The kitchen itself is fitted with attractive mid-tone wood surfaces and units matching the floor. 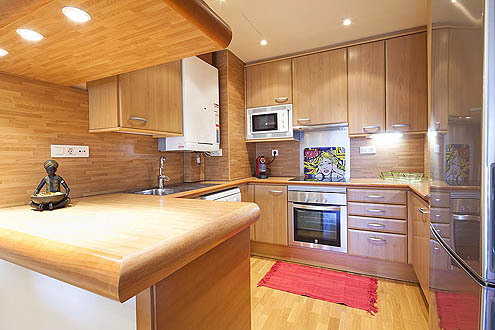 The kitchen is fully equipped with everything you need for self catering, an oven and microwave, dishwasher, coffee machine, as well as a washing machine. 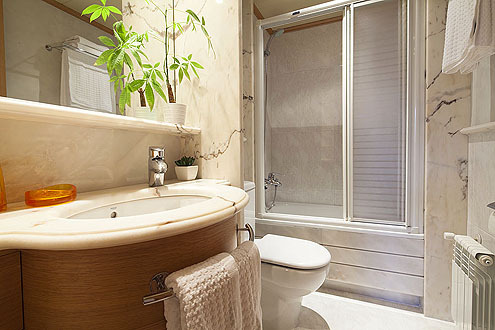 The main bedroom features a large double bed and double doors onto the terrace and is connected with the bathroom via a wide corridor with built-in wardrobes for your clothing and other belongings. 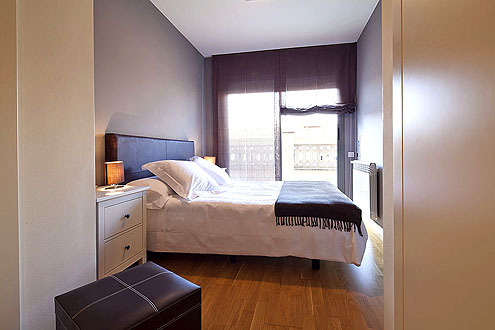 In the second bedroom there is a single bed and a single truckle bed. Also an spacious wardrobe. 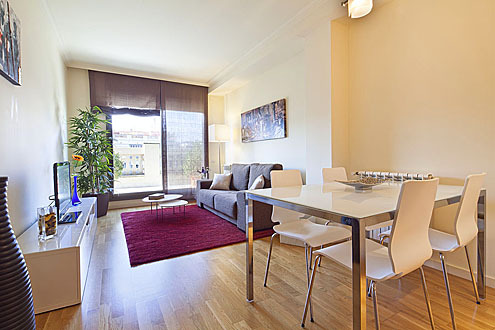 This apartment assures comfort and convenience in the heart of the city to anyone planning a stay in Barcelona. The Gran Via Luxury apartment is located on the Gran Via de les Corts Catalanes and close to where Gran Via crosses the other main central thoroughfare of Barcelona, Passeig de Gràcia. This part of town is most representative of the art nouveau architecture Barcelona is renowned for – both the fevered creations of Gaudí and the classic art nouveau town houses with their characteristic scrolling curvilinear decoration. It would be hard to pick a more choice location in fact. Within 5 minutes walk you can reach Passeig de Gràcia (home to two of the cities most popular landmarks, the Casa Batlló and Casa Milà, and to all the best upmarket shopping), Rambla Catalunya (the Rambla favoured by locals), Plaça Catalunya and Las Ramblas, El Born (Picasso Museum and Santa Maria del Mar church) and the Old Town. All the attractions of the centre and its bars, taps bars, restaurants and eateries are laid out at your feet. The Sagrada Familia can be reached in 5 minutes by metro from Tetuan metro station, just a few minutes walk along Gran Via from the apartment. (Ferrocarriles de la Generalitat de Catalunya) begins in Plaça Catalunya, and numerous bus lines run through here. 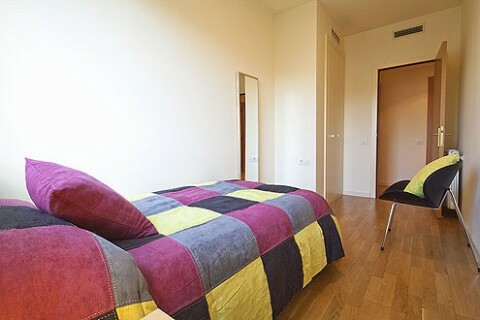 As well as Plaça Catalunya the apartment is also just a few minutes walk from Passeig de Gràcia station which is on the yellow line (L4) which will take you directly to the beach in ten minutes or up to Gràcia village (if you are feeling lazy, it is a beautiful walk) in no more than 5 minutes. 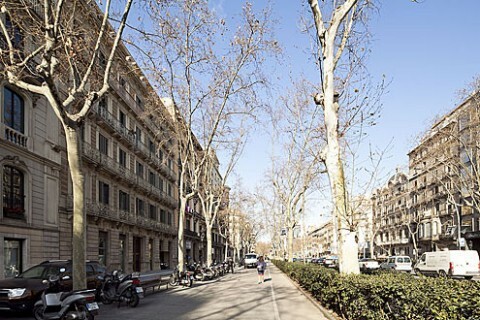 Passeig de Gràcia is also a stop on the Cercanías (local regional light rail) line that connects Barcelona with the airport as well as numerous other sights of interest in Catalunya such as medieval Girona, the beautiful coastal town of Sitges, and the beaches outside of Barcelona. As well as fantastic shops there are numerous local shops and supermarkets and a local market – Mercat de la Concepció, just three blocks away on Carrer d’Aragó. Barcelona’s food markets are a wonderful facet of the city which many tourists miss but if you in the city for a longer stay, you can begin to explore and buy your food fresh from the wonderful stalls offering amazing seafood, breads, Spanish ham and fresh fruit and vegetables. If you don’t feel like cooking then some of Barcelona’s finest tapes (Catalan for tapas) bars and restaurants are nearby – try embat for some wonderful Catalan cuisine. It was very comfortable and welcoming. Well equipped kitchen, lovely bathrooms, very roomy and spacious, comfortable beds. We looked forward to coming home each night after a long dayout. Best location ever! Easy walkinf to the sights or easy metro connections. quiet neighboorhood. Overall: absolutely wonderful stay! can't wait to come back! Ubicación y confort. Por su lado Miguel (Portero/Encargado Edificio). 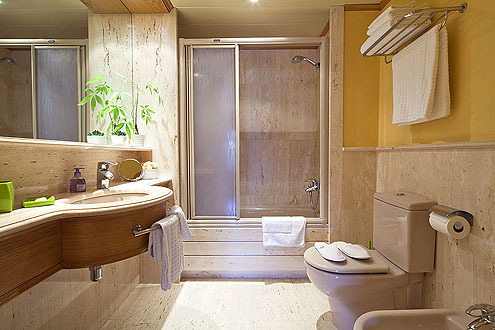 The two bathrooms. Enough space for a family. Close to the city center. It was a nice stay :) Barcelona is a wonderful and great city! We will come back! 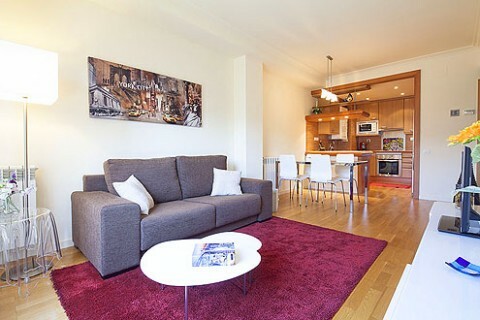 Great apartment, great location. Quiet unit and neighbors. Very nice apt. Overall - great place to come back to.